I was given a Diabetes Stor-More by Advocate to review. I’ve been using the Store-More for a few months now. Over all, I am happy with the Stor-More and recommend it if you have space. 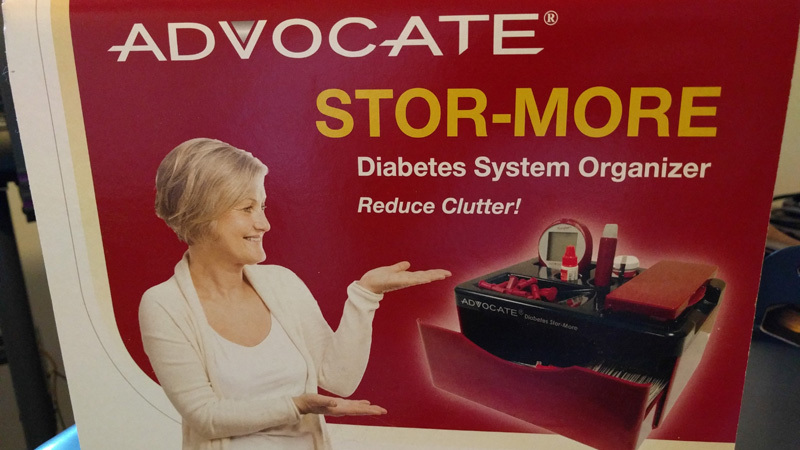 The Stor-More is an organizer for all your dog’s diabetic supplies. 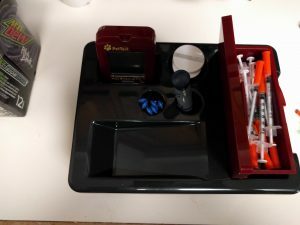 It has a place for your meter, test strips bottle, lancets, lancing device, control solution, and removal box for needles on the top of the organizer. It has a draw for extras or other supplies. The organizer is about 9″ wide, 5″ tall, and 7″ deep, although if you are using the needle box you will need about 2″ of clearance above the it. The organizer is made of hard plastic. It feels solid. Despite the weird lady on the box, the organizer looks alright on the counter. There really isn’t much setup besides putting your dog’s diabetic supplies in. The removal needle box will hold roughly 30 needles. Even if you remove the box and just use the compartment, it will still only hold 30 needles. You can definitely put more in the drawer. I only have a handful of lancets left but the place for the lancets seems like it will hold a similar amount. So about every 15 days or so, you will need to add more supplies. My wife was gracious enough to allow me to put this on the counter for the last month or so. We have a very limited amount of counter space. Overall this Stor-More is handy but not life changing. A definite plus is this does keep everything neatly organized. It comes in very handy when testing. Everything is right there. If you have the space for the Stor-More and test your dog a lot. Then I would say it is worth picking one up. It really does help keep everything organized so you can have a small amount of supplies out while keeping the rest in a closet or cabinet. Also, the Stor-More will work with any meter and supplies. For us, due to our limited counter space, I had all of Bender’s diabetic supplies in a drawer. I had created my own organizer. So there is a need for this type of product. Unfortunately for us we can’t leave the Stor-More on the counter and it won’t fit in the drawer and be usable. The organizer costs around $26. Which is an ok price. I found on other counter Diabetic Organizer for $25 + $10 shipping. The rest of the organizers I found were more for travel. 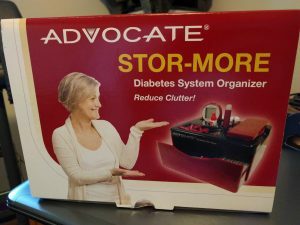 You can buy the Diabetes Stor-More by Advocate on Amazon.com. I keep the insulin (Novalin N, $24 at Walmart) the syringes, $14 for box of 100 at Walmart, the Keto-Diastix, bottle of 100 strips for $26 at Rite-aid (always have to order as they don’t carry it in the stores)in a cabinet in my kitchen, takes up a small space. Used to get the Sharps containers but easier to use a large can or glass jar (from pasta sauce) and drop it off at the vet’s for disposal.